I'm reading pilots saying they avoid slips on final to avoid spins. I'm prone to slip but I do avoid skids thinking spins enter from skids not slips. Are slips on final protection / margin or are they additional spin risk simply because they are uncoordinated? Obviously I think they are protection not risk. A spin happens when one wing stalls and the other doesn't. I don't know why there would be any added risk of a spin in a slip as long as the angle of attack is maintained correctly. Most of us do that by watching our airspeed. The most frequent sequence of events leading to a stall/spin accident starts when the pilot overshoots the turn to final. This usually results because of a crosswind which acts as a tailwind while on base. The pilot gets pushed past the runway extended centerline, and tries to get back lined up with the runway, but is afraid to bank too steeply, fearing a spin will result. So, instead, he or she pushes the nose around the turn with bottom rudder, while using top aileron to keep the bank shallow. This is, of course, an uncoordinated maneuver, but it's not an intentional slip (where one wing would be low). Rather, it's a flat turn. Of course, the plane comes down in the process, increasing angle of attack. It gets too low, so the pilot pulls back on the stick or yoke, stalling the inside wing and leading to the spin. Since all this happens at 500 AGL or less, it's usually (sadly) unrecoverable. And, of course, it's completely avoidable. If you overshoot the turn to final, DO NOT attempt to salvage the landing. JUST GO AROUND!!! And what Paul just described would be a skidding turn, basically opposite of a slip. Now, my understanding is if you are forward slipping and you let it slow down too much and you stall , the plane will basically snap roll to the other side and spin , no different than the skidding spin except you will have more time to react. Last edited by Warmi on Fri Nov 03, 2017 7:28 am, edited 1 time in total. Warmi wrote: Now, my understanding is if you are forwarding slipping and you let it slow down too much and you stall , the plane will basically snap roll to the other side and spin , no different than the skidding spin except you will have more time to react. https://www.av8n.com/how/htm/snaps.html does a good job of explaining. Seems skids are far more dangerous than proper slips and entering a snap roll likely needs rapid rudder input. Yes they are but I am personally very cautious when doing slips as well since you do end up uncoordinated , albeit with full awareness of that ( and thus more likely to be paying attention to your angle of attack ( since air speed is somewhat wonky during slips) ) - on the other hand skids are more insidious. I , personally, quite often bank at 40-45 or maybe even a bit more , if I find myself severely overshooting the final. To me banking in itself is not all that dangerous ( even at low altitude ) as long as I have enough airspeed and in general don't put too much load on my wings - i.e descending turn- better than trying to limit the bank and "helping out" with a rudder. Steep turns are not inherently dangerous. Contrary to popular belief, the angle of bank does not in itself increase stall speed. It is G load that increases stall speed. It's true that in level flight in a 45 degree bank, you're pulling 1.4 Gs (and at 60 degrees of bank, that increases to 2 Gs). But this is true ONLY if you are holding altitude. A 45 (or even 60) degree descending turn is a 1 G maneuver, as long as you don't pull back on the stick in an attempt to maintain altitude. And, since you're trying to descend on final anyway, there's no danger in the steep bank in and of itself. The danger comes in trying to level off (or reduce rate of descent) with elevator pressure alone, without leveling the wings first. This is a twofold problem, because back elevator while banking serves to increase the bank angle, significantly further raising stall speed. That's the main reason we teach our students to avoid steep turns in the traffic pattern, or otherwise close to the ground. Warm is right that a steep bank when lining up on final is not by itself dangerous. But neither is it necessary. There's no reason not to go around in that scenario, unless you're (1) out of fuel, (2) on fire, or (3) being shot at! Don’t you mean “a 1g maneuver”? Slips to lose altitude during approach are a normal maneuver. Skids to lose altitude during approach can get you killed. Indeed I did! Thank you for catching my typo, Andy. Back when I was training for my CFI 25+ years ago the instructor I was flying with ask to see a stall from a forward slip. With full up elevator, full rudder, and full opposite aileron, the airplane just shuddered and bobbed, but didn't break into a stall. I am not saying that all airplanes will react like that, but on that day the airplane I was flying did. I don't see why a slip would be a great concern. When slipping, both wings are moving through the air with the same forward velocity. Perhaps, due to the dihedral, maybe the angle of attack is not equal, I don't know. I don't think there would be any reason one wing would stall significantly sooner or more abruptly than the other wing. Now, in a skidding turn, the inside wing is moving through the air at a slower speed. Again, I'm not sure if the angle of attack is different, but it would stall sooner than the outside wing. 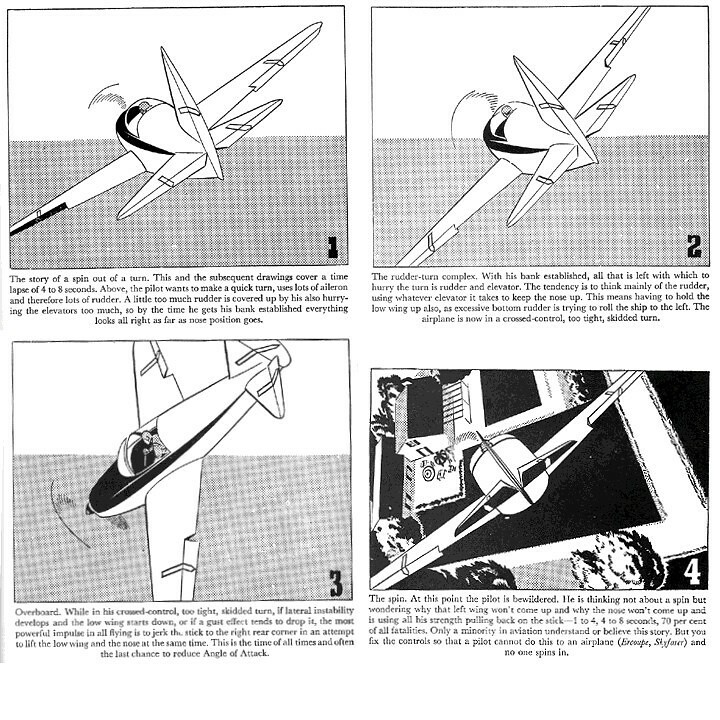 When it stalls, the inside wing will drop, and the outside wing, which is still developing lift, will come over the top of the airplane resulting in a spin. TimTaylor wrote: I don't see why a slip would be a great concern. When slipping, both wings are moving through the air with the same forward velocity. Perhaps, due to the dihedral, maybe the angle of attack is not equal, I don't know. I don't think there would be any reason one wing would stall significantly sooner or more abruptly than the other wing. Granted, skidding is far worse and abrupt. I used to teach cross-controlled stalls. The entry would be to bank the plane as if to turn, but to stop the turn with opposite rudder. As such, at entry there’d be too much bank for the rate of turn - one way to define a slip*. If held all way to a full stall, we could still find a pretty solid break in the direction of the held rudder, sometimes to an incipient spin. I think the main difference is that in an intentional slip a trained pilot naturally keeps a nose low attitude, and hence a good margin above the stall. And it would be relatively rare to load the wing much beyond 1g while maneuvering. 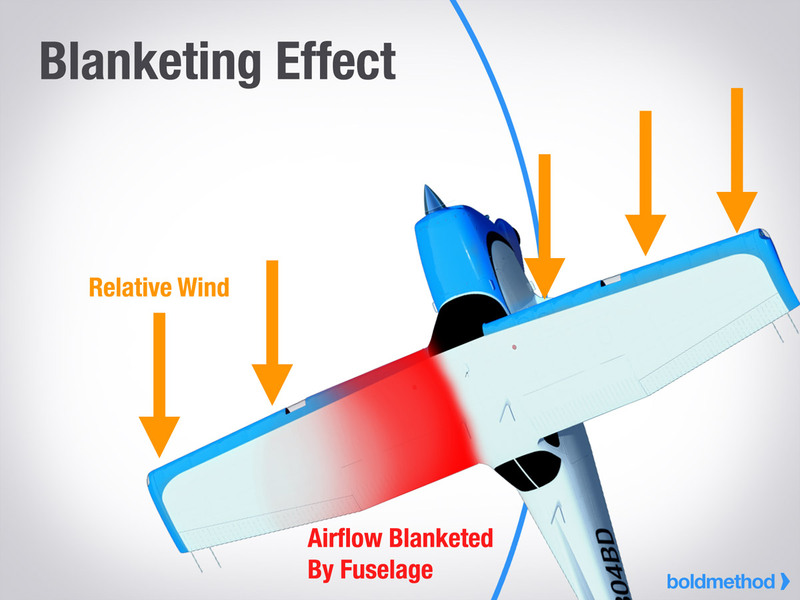 In a skid, the lack of sufficient bank can easily go unnoticed, and with the rotation occurring towards the lowered wing, there’s that much less time to react. Let me find an illustrative Cirrus accident which I’ll link to in my next post. *And a skid can be defined as too little bank for the rate of turn. Last edited by FastEddieB on Fri Nov 03, 2017 7:40 am, edited 2 times in total.